When the stock market falls for a prolonged period of time, usually losing value of 20 percent or more, investors call this a "bear market." Investors measure the market's decline by looking at the percent decrease in the stock price of multiple market indexes, including the Dow Jones Industrial Average (DJIA) and Standard & Poor's 500 (S&P 500). Investor pessimism causes an increased sell-off of stocks, which reinforces the downward direction of the market. A bear market is the inverse, or opposite, of a bull market, in which stock prices persistently head upwards. What Drives a Bear Market? A sustained decline in stock prices can happen for any number of reasons, such as investors panicking over economic news including declining corporate profits, a correction from a previous bubble of stock overvaluation, a financial crisis in one industry that, like a domino effect, impacts other interdependent industries. It could also be something as seemingly innocuous as the anxious foreboding of investors with a herd mentality. 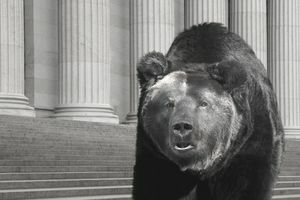 A prolonged bear market example would be the stock market crash of 1973, in which the market remained depressed for well over a decade. An experience like this can scare would-be investors away from investing; you never know when this type of market will materialize and it takes psychological and financial fortitude to ride out the storm. Ironically, this fear alone can sometimes keep a bear market alive. Generally, a bear market will cause the securities you already own to drop in price, perhaps by a substantial degree. The decline in their value may be sudden, or it could deteriorate slowly over time, but the end result is the same: The value of your portfolio holdings drops. During a bear market, some investors prefer to focus on two fundamental principles which allow for taking advantage of the current market situation. First, a bear market is only bad if you plan on selling your stock or need your money immediately. Second, falling stock prices and depressed markets are the friend of the long-term, value investor. If you typically invest long-term with the intent to hold your shares for decades, a bear market creates a great opportunity to accelerate your returns over longer periods despite seeming counterintuitive. With lowered stock prices, if you make periodic, fixed-amount investments over time in a stock, known as "dollar-cost averaging," you can bring down the average cost basis of your holdings and shorten your portfolio's recovery period once the bear market eases up. This way, you'll end up buying more shares when the price is down and fewer shares when the price moves up. Additionally, if you own dividend-paying stocks, reinvesting those dividends acts as a "return accelerator." The reinvested dividends reduce the cost basis of your portfolio as a whole so the quoted market value needs to increase by a smaller degree to reach break-even than your investment's original cost. When buying stock in a bear market, some investors choose the methodology of legendary investor Warren Buffett, "value investing," which entails choosing stocks based on the underlying company's operational quality and ability to generate solid earnings over time. These company stocks make good long-term holds and will likely still have stable earnings 10 or 20 years down the road. This brings up a third principle when dealing with bear markets. To take another cue from Warren Buffet, learn to separate the stock price from the underlying business, as they often have very little to do with each other over the short-term. Even if the market doesn't currently recognize a company's worth and undervalues its stock, if the company continues to make money as an operating business with solid financial and other characteristics, this says more about the intrinsic value, or essential nature of the company, than that reflected in its current share price. Despite the thoughts of certain academics, some investing experts believe the market is not perfectly efficient over periods of less than many years. Some investors see falling stock markets like a clearance sale at their favorite store; they load up on stocks while they can because history has borne out that prices will eventually return to more reasonable levels provided the company earnings materialize.